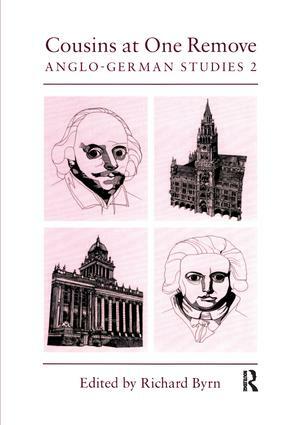 This collection of essays is a sequel to "Anglo-German Studies" published in 1992 by the Leeds Philosophical and Literary Society. The emphasis of this volume is on the English reception of German literature. Schiller, Kleist and Wagner - a great British tradition?, Fred Bridgham; a romantic in Ratzeburg - Coleridge's debt to North German "Provinz", Ingo Cornils; William Poel's "Wallenstein" - moment, Joyce Crick; "Our wretched German cousins" - A.R. Orage and Germany, Diane Milburn; Mephisto in modern English guise, Richard F.M. Byrn; Shakespeare into Celan - sonnets 1, 105 and 107, Raymond Hargreaves; rewriting, recycling - Friedrich D'rrenmatt and "The Tragedy of King John", Sydney G. Donald; Josephine Butler's campaign against the double moral standard and its repircussions in Germany, Ingrid Sharp; three letters to Jethro Bithell from the correspondence held in the Brotherton Library Bithell Collection - from Alfred Mombert (6/9/1909) edited by Susan Bollinger, from Franz Werfel (4/4/1940) edited by John Hogg, from Hans Carossa (9/5/1949) edited by Claire Harder.